Blood diamonds in Africa, terrorism in the Middle East, drug cartels in Mexico and tax evasion in Switzerland. HSBC truly is the world’s loco bank. This week, the ICIJ and a host of global media organisations published fresh revelations based on Hervé Falciani’s leak of thousands of HSBC Switzerland. Falciani’s leak made its way to the French government who passed on the details of thousands of potential tax evaders to governments around the world. Since then governments have taken varying degrees of action in an effort to recoup the potentially billions evaded in taxes. India has set up a special investigations team to prosecute any Indian citizens on the list found evading taxes. The UK on the other hand has recouped just £135m in five years and made the chairman of HSBC a government minister, who quit in 2013 to become a minister of the church. Few details ever emerged until now. The French newspaper Le Monde managed to get hold of the documents and working with the International Consortium of Investigative Journalists, has distributed them to news outlets across the globe. The files reveal that HSBC were happy to receive and hide money from practically anyone. Politicians with unexplained millions, a man wanted for murder, smugglers, arms dealers, royals, sports starts all had a home at HSBC Switzerland. The documents also reveal some of the techniques used and recommended by HSBC bankers to help their client evade the authorities. In the case of one Serbian client they warned him that a €20m transaction might raise suspicions and he should use smaller amounts. This reminds us of a previous Wrapper story where a Saudi Prince was allegedly caught on tape saying HSBC prefers him to use its Swiss branch for money laundering. The bank now admits that its compliance efforts were sub-par and says it has taken action to clean up its act. And yet when a former compliance officer in 2013 outlined her concerns that there was lax compliance at the bank, she was dismissed. The world’s loco bank indeed. Swiss banks may have been the centre of a number of scandals over the last few years. But according to the Australian Tax Office, its business giants have not been put off using the Alpine tax haven. Australia’s tax inspectors, in a submission to the government, have revealed that the amount of money moved by Australian companies to their subsidiaries in Singapore and Switzerland is increasing. The submission adds: “The large volume of related-party flows with Singapore and Switzerland do not correspond with trade flows as these countries are commonly used as financing hubs for Asia and Europe respectively”. The document also notes that wealthy families are using complex corporate structures to avoid taxes. With all this tax avoidance still going on, it is surely even more surprising that the Australian government is planning to allow companies to perform their own tax audits, rather than leave it to tax inspectors as Wrapper reported last week. The UK Parliament’s Public Accounts Committee has torn into the role of global bean counters PwC in helping big companies avoid tax. 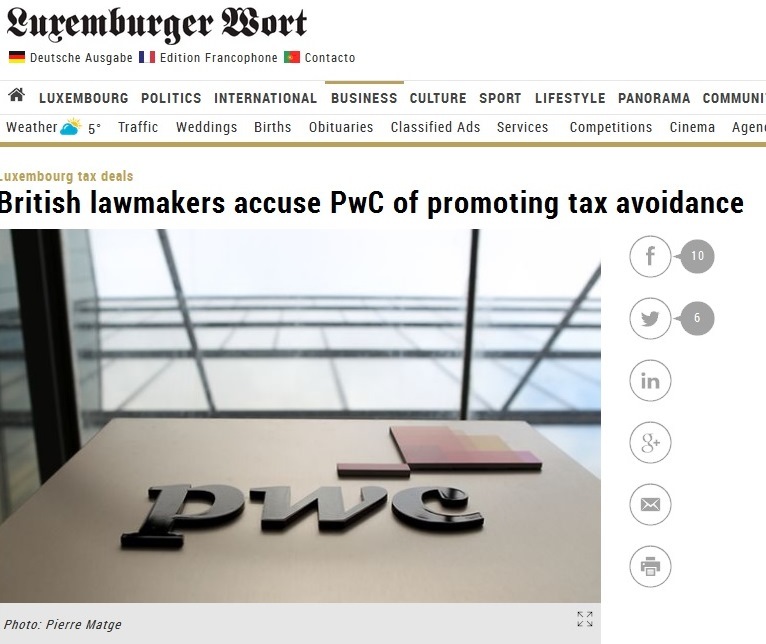 Its chairwoman, Margaret Hodge accused the company of marketing tax avoidance schemes on an industrial scale, misleading parliament in the evidence they gave and said they were sceptical that the UK tax authorities had even been kept informed of PwC’s activities. The report also states that the Committee could not see what pharmaceutical giant, Shire’s activities in Luxembourg were for other than to avoid tax. Shire has two staff in Luxembourg out of a global workforce of 5,600, yet books $10bn in interest payments from intra-company loans. The final conclusion from the committee is that the tax industry simply cannot be trusted to regulate itself. As indictments go, this one is pretty, pretty big. The full report from the committee is available here. The New York Times has produced a long article that looks at an effective alternative to hiding money in Swiss bank accounts. Through the use of anonymous shell companies, the world’s corrupt elite are increasingly hiding money in the centre of New York by buying up high value real estate. The NYT revealed a vast amount of property in the US has been bought by secret anonymous companies. In some high value apartment blocks, over 50% of the units are owned by shell companies, some with catchy names such as 25CC ST74B L.L.C. Often these homes are used to store wealth rather than a place to live. Only 30% of these buildings are occupied at any one time. 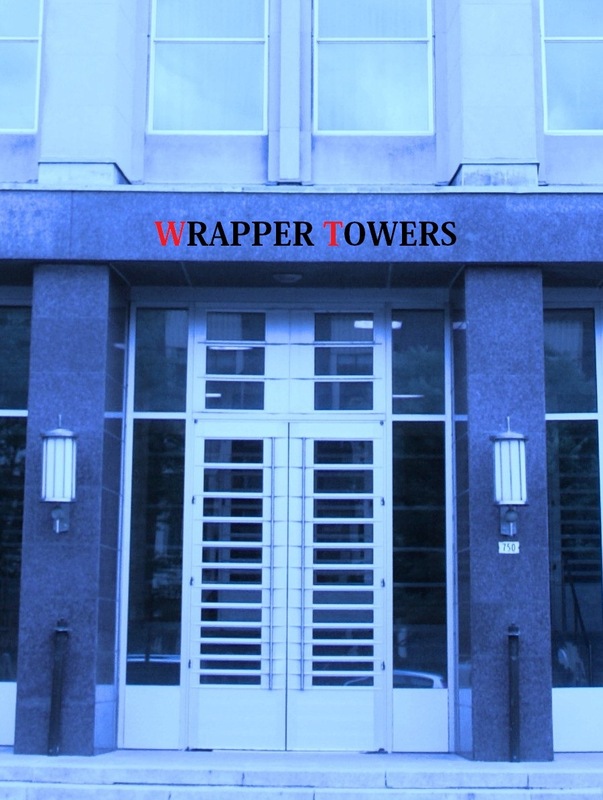 This trade in property allows extremely rich individuals to move money without the usual checks required by banks on where that money has come from, a highly effective tool for corrupt officials, money launderers and tax avoiders. The investigation by the New York Times attempted to uncover some of the names behind the secret real estate companies. The piece took over a year to put together.